Everyone's "throne" should be so royal! Lacy pineapples beautifully dress up the common commode. 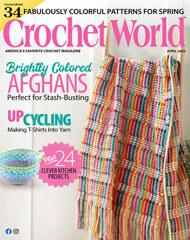 This e-pattern was originally published in the August 2010 issue of Crochet World magazine. Size: Tank Cover: 18" x 9". Lid Cover: 14" x 16". Made with size 10 crochet cotton thread and size 7 (1.65mm) steel hook.